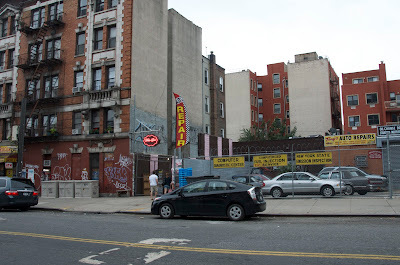 Fette Sou (fat pig in German) is a BBQ joint wedged between a graffiti scrawled apartment building and the parking lot of Frank’s Auto Repair Shop in Brooklyn, New York. I’d describe it as a Brooklyn Hipster hangout with an attitude of ‘we’ll do it our way’. This eatery, set back off Metropolitan Avenue, is only a block from the Brooklyn Queens Expressway. It’s located in a renovated cinder block building that used to be a garage and from the street resembles a chop shop more than a restaurant. Most customers coming here for the first time probably wonder what they’ve gotten themselves into as they walk along what used to be the driveway to a garage. The advertised outdoor dining is actually funky picnic tables lined up along the driveway on one side of the apartment building. The bay doors to the old repair shop are always thrown open. Bare light bulbs and a warm glow emanating from the phonograph-horn light fixtures reassure the curious and hungry enthusiast that something good is going to happen. There’s no table service and a sign positioned at the side door clearly states the simple, easy to follow and friendly rules: Seating is communal, there are no reservations, everything is on a first come first served basis and the bar and food tab are paid separately. This is definitely a carnivore’s paradise. All the meat is purchased from the Berkshire farms in Upstate New York, a farm renown for its’ high standard in meat production. There is succulent house-cured and pit-smoked pastrami, an all time favorite of mine with its peppery layer of goodness. Hand pulled pork shoulder, country loin chops, St. Louis style pork ribs, pulled lamb, ham and sausages; everything is delicious and no matter what you order, it will be wonderful and juicy. The meats are only treated with a dry rub, the owner’s personal recipe for a panela/espresso based spice rub. All the various cuts of meat are put into the Southern Pride gas-and-wood-fired smoker that is capable of slow cooking 500 pounds of meat at a time. No sauce is used in preparing the meat, not in the cooking or afterward, though a homemade sweetish BBQ style sauce is placed on every table for the diner’s discretion. Meat is sold by the weight and orders are made directly to the butcher standing behind the meat counter. Succulent slabs of cooked pork, beef, lamb sit on the other side of the old fashioned glassed case waiting to be thickly sliced. Another treat are the ropes of link sausages, sometimes sweet, sometimes spicy, which are sold a link at a time. As you’ve probably already guessed there’s nothing fancy about this place. The menu changes daily depending what is brought out of the smoker that day. Expect your order of meat to be served on a sheet of brown butcher paper spread over a cookie tray. Are there sides? Yeah, they’ve got sides. There is a vinegary German potato salad, cold slaw and a slightly sweet rendition of baked beans. The sides are spooned into small paper baskets. But no one comes here for the sides, though they do help to cleanse and sooth the palate between the rounds of eating the juicy slices of meat. The place opens at noon on the weekends and during the week only serves dinner, but the rule about first come first served seating is no joke. If you get the Fette Sou munchies after eight or nine o’clock at night you’ll find yourself standing in a long line with maybe twenty-five to thirty other hungry folks. And maybe if you are lucky you’ll get to sit next to the woodpile in one of the old lawn chairs. The bar in Fette Sou is as unique and appealing as is the food. The bar stools are fashioned from John Deer tractor seats and would be more than comfortable for any farmer wandering into Brooklyn to grab a bite to eat. There is a selection of forty American whiskeys and anyone of them would go well with the slabs of meat on your butcher’s paper. They do not serve bottled beer but offer ten local brews on tap. The beer is available in increments from a full gallon to half pints served in Ball jam jars. The wall-mounted taps for the local beers are each attached to a variety of recycled butchers tool: a cleaver, a boning knife, and a well-worn mallet. Adding to the ambiance is the virtual fireplace. A TV set into a wooden mantle displays a video of a roaring fire from noon until closing time, summer or winter. And even on the sweltering days of a New York City summer this fireplace provides a welcoming sense that makes the customer feel like they’ve come home, even if it’s only to stay for supper. Thank you so much Thelma for your very kind words!!! Okay, so now you’ve made me hungry for BBQ at almost midnight, Margaret!! Great article…I can almost feel the atmosphere. A few months late, but I have to say that I wish I could stop by this place for a tray of BBQ with sides. You make it all sound so good and like so much fun. More of these would boost my farm business. Always love a hearty meal of pork at the end of the day! Having eaten at this place and enjoyed the brisket, the potato salad, the ribs, the beer, and the sauerkraut, I second the deliciousness you described in this review – and I really enjoy your entertaining way of writing.